Fin-de-siecle Paris is often depicted as a decadent playground savoured by the likes of Oscar Wilde, but the period was also one of great technical innovation, from the building of the controversial Eiffel Tower in 1887 to the introduction of electricity in middle class homes. Interestingly, both feature in Wash Westmoreland’s lyrical biopic, Colette, helping to signal the time; as for place, the film is not alone in finding that Budapest today offers more authentically “Parisian” staircases and interiors. The story is at first a portrait of a marriage, between the critic Henri Gauthier-Villars (who wrote under the pen name “Willy” and employed a small stable of impoverished younger authors to ghost his stories, while he enjoyed the literary salons and amorous liaisons of the city) and a pretty, nature-loving young country girl, Sidonie-Gabrielle Colette. Parisian society was at first sneering at this ingénue, who had brought no dowry and who bristled at the extravagant pretensions of le beau monde. But soon the young wife displays not only a free spirit but a creative one as well. Determined not to be constrained to the domestic life of a dutiful wife she starts to write herself, and although at first Willy derides her efforts soon he accepts that she has talent and starts publishing books, in his name, that are essentially her work, with just a few of his own tweaks here and there. 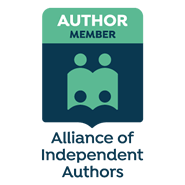 A series of effectively autobiographical novels featuring “Claudine” become best-sellers and Colette (as she now calls herself, symbolically reclaiming her maiden name) is no longer satisfied to have Willy take all the credit. She has also become less tolerant of his arrogance and bullying, his endless philandering and profligacy, while herself engaging in affairs with other women, notably the cross-dressing aristocrat Mathilde de Morny, “Missy”. The marriage is doomed but a new literary star is born and and a feminist blow against male chauvinistic piggery has landed with effect. This is indeed a feminist film, albeit directed by a gay man (touchingly dedicated to his recently deceased husband and collaborator Richard Glatzer), but it does not preach. Instead it allows the story to gently unfold against a background of luscious canvases, both rural and urban. Keira Knightley magnificently conveys Colette’s evolution from country girl to creative talent; one so engages with her performance that one accompanies the character along her journey of discovery, empathizing at every twist and turn. Dominic West is also effective as the caddish Willy, a puffed-up peacock who is occasionally shaken by moments of insecurity, self-doubt and pure panic. The story of Colette has been told on film before, but not nearly so well. Westmoreland succeeds brilliantly. not only in the narrative of an amazing life but also in producing a beautiful work of art. The suspension of disbelief is an essential element of the relationship between an audience and any play or film. But some productions require more suspension than others. 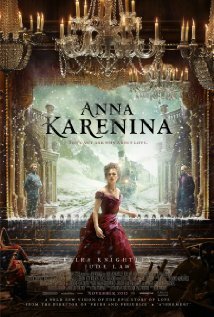 Joe Wright’s new take on Tolstoy’s great novel Anna Karenina — with a screenplay by Tom Stoppard — straddles this complex late 19th century Russian fictional world by employing a variety of genres: part theatre, part cinema, part mime and part dance. The film obliges the viewer to surrender to its own rules, or else leave. 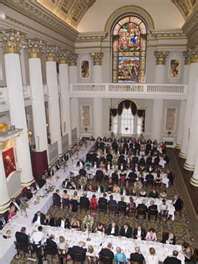 Of course one is bowled over by the sumptuousness of the décor and the costumes, as well as by the beauty of the actors; Keira Knightley is a very different Anna from Greta Garbo, but one can understand the jealousy she could arouse, the passion and the dismay. Jude Law, as her wronged husband, is dignified and grave. Aaron Taylor-Johnson (Count Vronsky) has had his hair dyed an angelic gold. It is all very stylised, maybe too much so at times. But there are images that linger in the mind, troublingly, as they do (far more profoundly) after reading the novel itself. The dynamic between Sigmund Freud and Carl Jung was one of the most fascinating and enigmatic of the early 20th Century, inevitably shaping the development of psychoanalysis and related fields. No wonder it proved such a tempting theme for Christopher Hampton in his play, The Talking Cure. 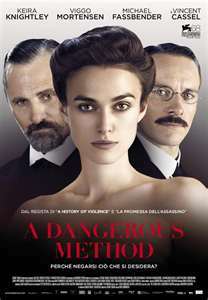 Hampton subsquently wrote the screenplay for the film A Dangerous Method, which is now on general release in cinemas in the UK. David Cronenberg’s direction is deliberately slow-paced, befitting the elegant twilight of Mitteleuropa in the years before the Great War. The Austrian and Swiss settings are truly beautiful, as indeed are the clothes, especially amongst the haute bourgeoisie. One paradox in the Freud-Jung dynamic was that it was the young man who had the wealth (through his extraordinarily forbearing wife) as well as the ethnic security that would soon become such an issue. Michael Fassbender plays Jung rather like a junior civil servant of good family, very punctilious and eager for advancement, until the floodgates of passion are opened in a totally unprofessional way by his patient and later colleague, the ravishing Russian Jewess, Sabina Spielrein (Keira Knightley, who puts more demented, jaw-distorting vigour into this role than one might have expected from this graduate of Pirates of the Caribbean). Viggo Mortensen is oddly cast as Freud, looking nothing like him, but as he revealed in a recent interview in the Camden New Journal, he did a huge amount of research into the personality he was portraying, not just through reading books but also travelling to Vienna to soak up the atmosphere. Mortensen says that what struck him most about Freud was his sense of humour, though this impishness doesn’t really manifest itself in the this film. Instead, viewing leaves one with the sadness of nostalgia for a byegone age and for the failure of people to adequately communicate with and tolerate each other. The end credits remind one that Spielrein, after returning to Russia, was taken by the invading Nazis to a synagogue in World War II and shot. Freud managed to flee, with difficulty, to L0ndon, with some but not all of his large family. And so psychoanalysis migrated from the German-speaking world to the English-speaking world. Yet I am left feeling that this film would have worked far better in German, though of course Hollywood would never have put up with that!